Dental implants are changing the way people live! With them, people are rediscovering the comfort and confidence to eat, speak, laugh and enjoy life. 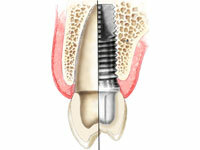 Please call us for a Chicago dental implants consultation if you are considering dental implants. Dr. Cabrera has received extensive training in Implantology. He has been successfully placing implants since 1987 Through continuing education, Dr. Cabrera is abreast of the most current information on implant dentistry. Part of the evaluation will probably involve impressions by your dentist to evaluate your bite. We may also employ the use of CT Scans which allow us precision that was not previously available. With the help of a computer program we can not only evaluate your jaw in one millimeter increments, but can actually do simulated procedures in the computer to determine the best approach for you. A thirty two year old woman has lost her two lower left molars. A C.T. scan allowed us to examine her jaw in multiple dimensions and to create a three dimensional model of her jaw and do virtual treatment on the computer model before executing the treatment on the actual patient. With this type of detailed planning we are able to effectively communicate with your dentist and create the most realistic and accurate results possible. Dental implants are metal anchors that act as tooth root substitutes. They are surgically placed into the jawbone. 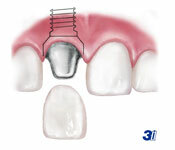 Small posts are attached to the implant to provide stable anchors in the gums for replacement teeth. For most patients, the placement of dental implants involves two surgical procedures. First, implants are placed within your jawbone (stage 1). Healing time following surgery varies from person to person, based on a variety of factors that include hardness of bone. In some cases, implants may be restored immediately after they are placed. For the first three to six months following surgery, the implants are beneath the surface of the gums gradually bonding with the jawbone. You should be able to wear temporary teeth and eat a soft diet during this time. At the same time, your restorative dentist designs the final crown, bridgework or denture, which will ultimately improve both function and aesthetics. After the implant has bonded to the bone (3-6 moths), the second phase begins. Dr. Cabrera will uncover the implants and attach a small healing collar. After two weeks your general dentist will be able to start making your new teeth. An impression must be taken. Then posts or attachments (abutments) can be connected to the implants. The teeth replacements are then made over the posts or attachments. The entire procedure usually takes six to eight months. Most patients do not experience any disruption in their daily life. Sometimes stages 1 and 2 can be combined, decreasing the waiting time and number of procedures. If you will be having a tooth extracted that is in the front, we want to make sure that you have a temporary tooth so that you have an immediate temporary replacement. Your dentist will take impressions of your teeth and make a temporary removable appliance that will be delivered to our office before your surgery. Sometimes called a “flipper”, the appliance is similar to an orthodontic retainer that has a tooth or teeth attached. Immediately after the extraction, bone graft and implant placement, Dr. Cabrera will place the appliance so that your appearance will not be disturbed. 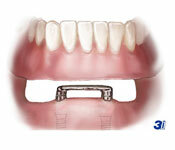 For patients that have never worn a removable appliance, there is typically an adjustment period to the new appliance. In select cases, not only can we extract the tooth and place the implant at the same time, but Dr. Cabrera can place a connector (abutment) on the implant so that your dentist can place a temporary crown on the implant that same day. At the time of your evaluation we can determine if you may be a candidate for this procedure. Patient presents with a fractured bicuspid tooth which cannot be saved (Fig. 1) The x-ray (Fig. 2) shows infection at the end of the root and Fig 3 shows the fracture of the tooth after it was removed. She would like to avoid using a removable temporary appliance while waiting for the implant to fuse to the bone. Because of the excellent bone, we were able to place the implant and a connector (abutment) at the time the tooth was extracted (Fig. 4). She then proceeded to her dentist’s office where a temporary cap was made. Fig. 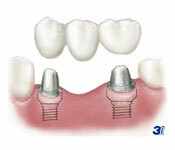 5 shows a schematic of the implant abutment and temporary crowns. Fig. 6 shows the crown in place one week after the surgery.